Started in 1995, the overall fastest man and woman gets the follow year’s entry fee waived for Le Grizz or a partner Montana 50 Miler. “Special” Awards are created and given at random. Any Starter is eligible to be the arbitrary victim. The purpose of these awards is to provide “Special” recognition for those victims who have distinguished themselves through substandard performance and would otherwise escape recognition in any civilized competition. Behavior Meriting Award: Mark: Took vehicle route to finish line, adding half-mile to his run. Betty: Frequent botanical studies along the course. Behavior Meriting Award: Sorest feet (in Glenna’s case, blisters the size of her toes on her toes). Inscription on Award: “Just” on one, “Married” on the other. 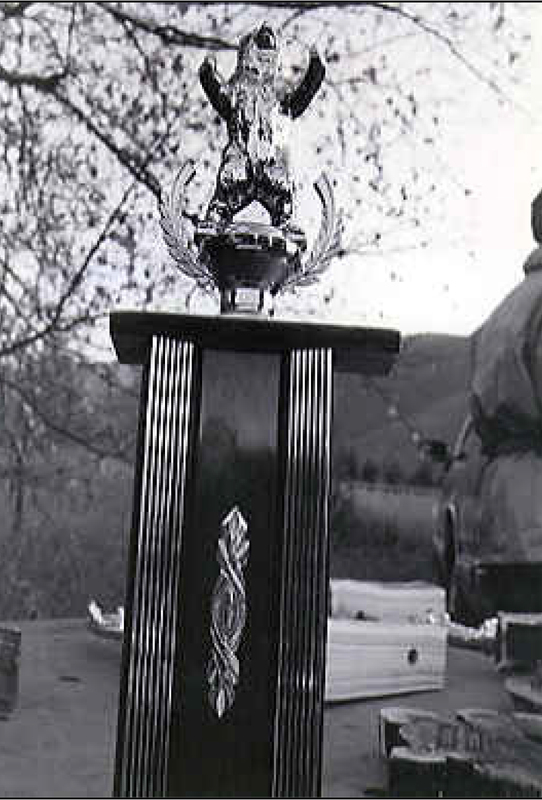 Description of Award: Firefighter mounted on a burned plaque. Behavior Meriting Award: Mark: Took early start, then paced Mark Tarr and finished in first 1/3 of field. Judy: Encore performance of 2001 registration problems. Description of Award: Engraved plaques, each with an adult grizzly bear sitting on his haunches. Behavior Meriting Award: Two-year-old son of perennial finishers Jim McKenzie & Colleen Marrinan. Description of Award: Zip-up pajama suit w/feet and Le Grizz emblem, bear tracks. Behavior Meriting Award: Finished seven Le Grizz runs after turning 70, all under ten hours. Description of Award: Plaque with a gray grizzly bear sitting on a wooden shelf. Behavior Meriting Award: Disintegration of garment-bag rainwear during a squall. Description of Award: Appropriately exposed statuette on a plaque. Behavior Meriting Award: Required the services of a Massage Therapist during the run. Description of Award: Engraved plaque with appropriate ornamentation. Behavior Meriting Award: Felt nauseated at the finish line – course was almost too long. Description of Award: Engraved plaque with hunter drawing a bead on a runner. Behavior Meriting Award: Not stopping at the aid station checkpoints. Behavior Meriting Award: Got cold, had to drop out. Description of Award: An upright blue grizzly bear. Behavior Meriting Award: Dropped out with hamstring problem. Description of Award: A skull on a plaque. Behavior Meriting Award: Dropped out early to save knee. Description of Award: A bust medallion hanging from a plaque by a loose screw. Behavior Meriting Award: Blog post addressing Forest Service cancellation of event permit. Behavior Meriting Award: Ruptured bicep arm wrestling son after Grizz-Cat game. Behavior Meriting Award: Oldest woman @ age 77 to ever complete Le Grizz. Description of Award: A case of 100 Hammergel packets (apple/cinnamon).